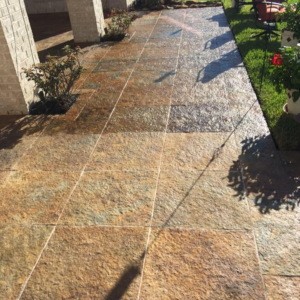 Are you trying to figure out what to do about your Flagstone Sealant Houston needs and you haven’t yet made any progress? If you’re struggling with a flagstone surface in or outside of your residential or commercial building, it can be difficult to handle it all by yourself. Make sure you give yourself the best shot at success by trusting the TSSPRO Sealant. This is a high quality sealing product that will properly protect your flagstone for years to come. Flagstone is a beautiful stone that is generally loved amongst local Houstonians. It’s also known as sandstone and is made up of quartz and feldspar. You can count on this stone to provide you with years of great condition for years to come in both residential and commercial environments. Many clients choose this material because it provides them with an affordable way to enhance the aesthetics of their patios, pool decks, walkways, and more. Flagstone is great, but just like every stone in the world, it’s not perfect. Because it is porous, you’re going to have to look out for damages and potential stains. Acidic liquids such as bleach and vinegar can truly cause problems for your surface. In addition to this, you’ll also have to deal with potential scratching if you’re using this for your backyard patio. Heavy furniture can truly cause some major denting and scratching that nobody wants to deal with. In case you didn’t know, we have a sister company in Texas that has been helping local customers with their cleanings, sealings, and restorations for years. Over time, we’ve noticed that there are many products on the market that simply don’t get the job done. Most of us tend to trust the biggest brands and manufacturers, but simply doesn’t work in our industry. Many of the most famous makers of sealants were providing people with low quality acrylic sealants. These products do nothing more frustrate workers and disappoint customers. Because of this, we were ready to start taking matters into our own hands. Our team was already handling the application of sealants as well as cleaning and maintenance. With years of expertise in this business, why not just create our own proprietary sealant that we have complete trust in? After coming to this realization, we’ve finally understood how important it is to provide customers and employees alike with the best possible product. Today, we’re proud to announce that we have a line of all-natural, alcohol-based sealants that are some of the best in their class. These are commercial grade products that give our customers a great solution for their sealing troubles. With their affordable prices being accessible to all, you’ll be able to count on these products to provide you with amazing results for years to come. Are you attempting to prevent your stone from crumbling and eroding suddenly? This is something that far more common than it should be, but our commercial grade sealants can help you avoid this fate. The TSSPRO-600 provides you with a densifier consolidator treatment that will protect against crumbling. You can use this for indoor and outdoor surfaces and enjoy a high level of protection for years to come. 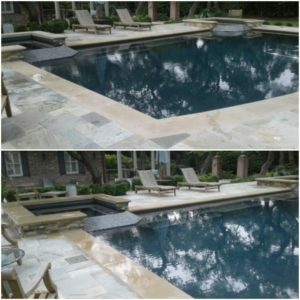 If you have flagstone pool deck, you might be dealing with mold and mildew problems that are causing a lot of stains, discolorations, and deterioration. This is a very common problem amongst our clients and customers, but we have a solution that works in your favor. Choose the TSSPRO-700 if you’re trying to fix this type of contamination. This is a waterproof sealant that can protect your surface from moisture and block out potential staining. The sealant will give you ultimate protection while also being completely fireproof. This is an ideal product if you are looking for an all-inclusive protection from the concerns you have with your tapestry. Once you apply this sealant, you will have protection for years to come. However, it’s important to remember that you’ll have to make sure your surface is completely cleaned before it is applied. This will ensure you won’t accidentally seal in pre-existing dirts and contaminants. In addition to this, do your best to keep up with regular cleanings afterwards. This is something that can help you make sure you don’t have to deal with stains and discolorations accumulating and causing unnecessary trouble. As you can see, there are a lot of different solutions for a plethora of different stones and surfaces. Every residential and commercial tapestry is different, and you’re going to need a company who understands and embraces. With the TSSPRO Sealant professionals on your side, you’ll never have to worry about this. We don’t depend on cookie-cutter solutions, and we’re always willing to help customers acquire a personalized answer to their problems. You can count on us to relieve you of your issues in the best way possible. When you’re unsure of how to handle your Flagstone Sealant Houston problem, reach out to our professionals. The TSSPRO Sealant is a high quality product that won’t let you down, and you’ll be able to count on us to provide you with solutions that exceed your expectations. If you’re ready to start working on a solution that will withstand the test of time, contact our team. Call us today at 888-958-0556 for more information on our many products and services. We’re ready to provide you with the answers you’re looking for. Houston is the energy capital of the world. We have numerous energy companies and Fortune 500 business that operate here in our city. We also have a thriving cultural arts scene. The theater district is one of the best in all of America. Here, you can find Catastrophic Theatre, an experimental theater led by some of Houston’s brightest minds. Take advantage and visit the professional sports teams in our city. We have numerous groups that are hosted right here in Houston. The Rockets, Texans, and Astros are only a few!